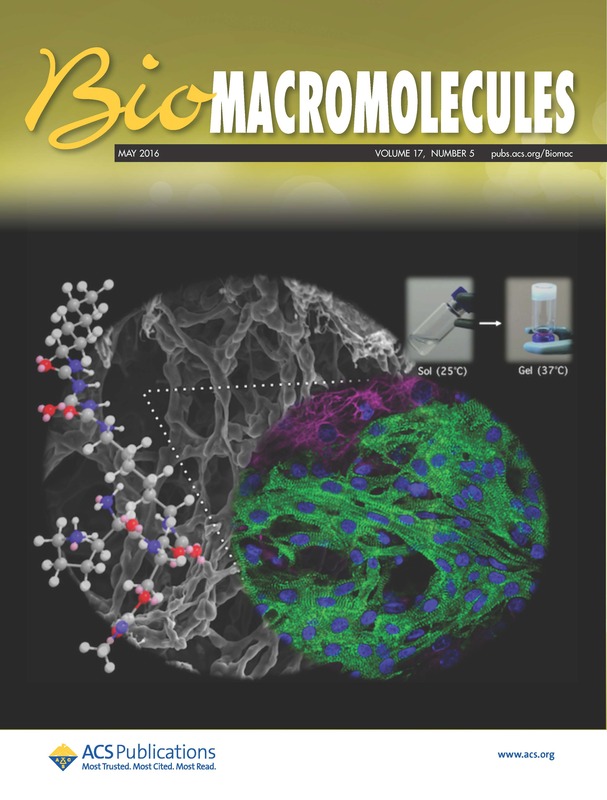 Bioengineering assistant professor Daewon Park’s research “Biomimetic Polymers for Cardiac Tissue Engineering” was selected as the cover for the May 2016 issue of Biomacromolecules. About the cover: an injectable biomimetic reverse thermogel (RTG) was specifically engineered to support long-term cardiomyocyte (CM) survival. This RTG biopolymer provided a solution-based delivery vehicle of CMs, which transitioned to a gel-based matrix shortly after reaching body temperature. For this investigation, the RTG was biomolecule-functionalized with poly-L-lysine or laminin. We found that the protein-functionalized RTG stimulated neonatal rat ventricular myocytes (NRVM) to spread and form heart-like functional syncytia.